Gansbaai (Goose Bay), about a two hour drive east from Cape Town, has some of the best great white shark diving in the world, primarily because of the large seal colony at Dyer Island. We visited there in January 1999 and cage-dived with Marine Dynamics, who were using a particularly ingeneous shark attractant method that didn't mess the water with burley. 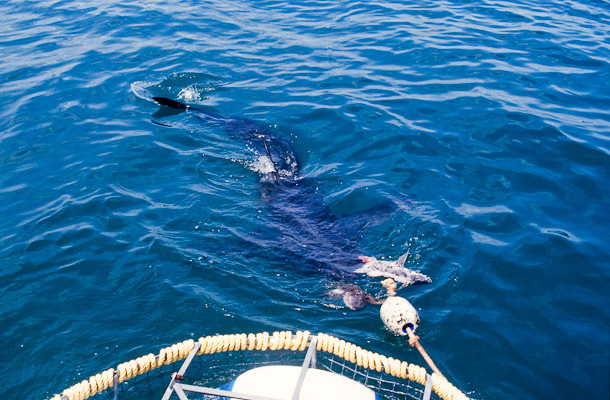 On the first day we saw one shark fleetingly - not long enough to get in the cage - but on the second day we had three around the boat, one was a monster 4 m female. It's difficult to get in the cage when they are right by the boat, but having plucked up the courage, it was well worth the adventure. I was surprised how circumspect they are. I did not feel I was on the menu, or threatened in any way, but it certainly produced an adrenaline rush. They talk about Africa's Big Five; well there certainly is a Sixth. What an experience! Those few minutes with such a stunning creature fundamentally changed my attitude to sharks. I want to do it again. UW pics taken with my old Nikonos I and subsequently scanned.